One of the stranger and more beautiful stories to manifest in the gaming world this week, I think. Elite: Dangerous has given birth to an unintended, emergent style of gameplay; a destruction derby like affair where players gather in no combat areas to both race and gleefully smash into each other until a victor limps from the fray. It’s good fun, but ramming has also been used by trolls out to ruin other people’s day. That’s probably why Frontier Developments decided to make hurling your ship into other players’ a criminal offence in no-fire zones. PCGamesN reports players were having none of this. 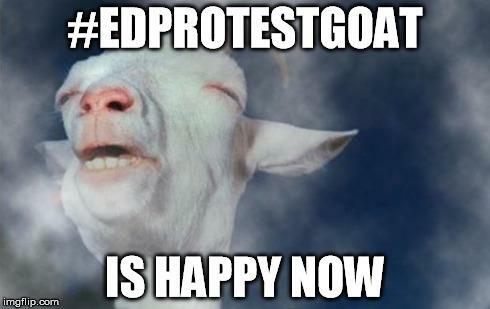 Gathering under the hashtag #EDProtestGoat, the community protested the decision by repeatedly posting images of goats. This tactic has proved successful, with lead designer Sandro Sammaco responding to the hashtag on the game’s forums. “EDProtestgoat: I’ll need to check with some clever coder folk on this, but I’m hopeful that we can have this crime not squawked with ‘don’t report crimes against me’: as long as all participants use this functionality then they would be safe to race near each other – though hitting spectators would still trigger the crime,” they wrote. Elite: Dangerous is available for Mac and PC, and is on its way to PS4 and Xbox One.